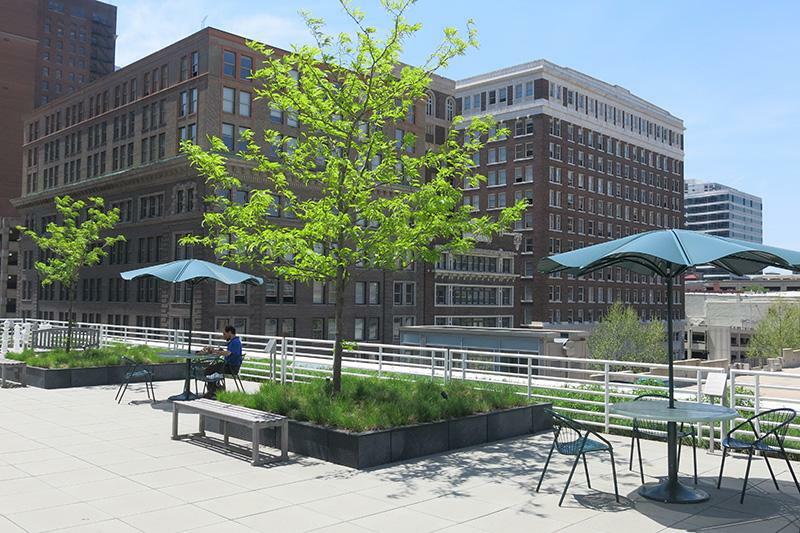 Downtown's best outdoor event space that gives attendees the opportunity to soak in the urban atmosphere in a comfortable setting. Existing patio/outdoor furniture includes tented tables, moveable chairs, and wooden benches. Contemporary landscaping that features native grasses and trees. Decorative lighting on perimeter rails, tree planters, and glass tiles add festive mood at night. Life-sized chess set is available at no additional cost. Library furniture cannot be used on Rooftop. All setups must be rented through outside vendor. DJs and Heavy Bands cannot be accommodated on the Rooftop due to noise controls. When used in-conjunction with the adjacent Gladys Feld Helzberg Auditorium, auditorium rates apply.